The painting won't be complete until November 29th (as I will be finishing it live at Dunbar Eurosport's Customer Appreciation Day). 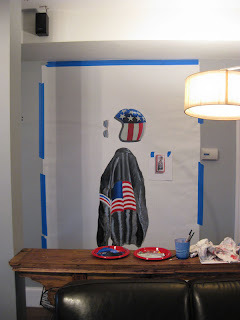 I'll post pictures of the event and finished painting. 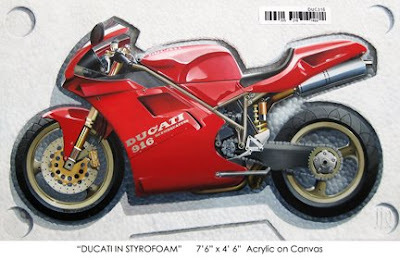 When the Ducati painting was nearing completion she sent an email out to several local Ducati dealerships to get some feedback. We got a great response and one dealership invited me to attend their Customer Appreciation Day. I'll be at Dunbar Eurosports in Brockton, MA signing paintings on November 29th. 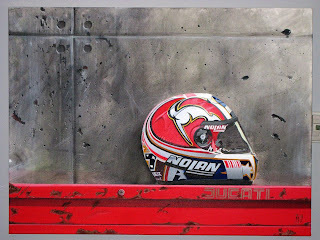 They wanted me to be painting while I'm there and since the Ducati painting is too big to lug around (not to mention, finished) , I started a brand new painting...Casey Stoner's Helmet. Here are the first progress shots. This is a new adventure for me. As an artist, I've only ever sold my original work. 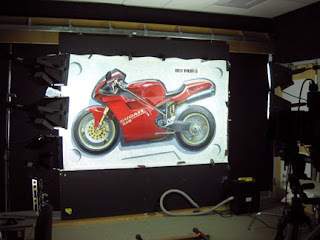 For the Ducati painting, I decided it was time to reseach the world of fine art printing. After countless phone calls and several meetings, we found Ditto Editions. Ditto Editions uses some highly impressive scanning devices/printers/inks to accurately capture and reproduce original works of art. It's the closest you can get to an original painting. But it won't take them 2 years and 300 hours to reproduce. 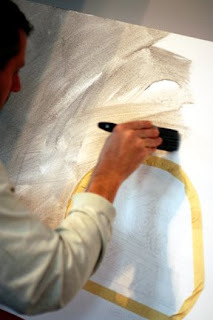 The first step in the process is to digitally capture the artwork. 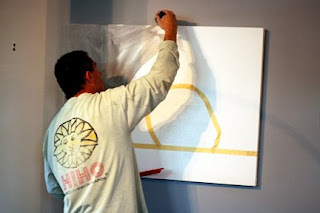 This photo was taken in their studio, while they set up proper lights and equipment to capture the painting. The next step will be the proofing and printing process...stay tuned! We (my wife Kerry and I) dragged the bike out to the driveway to get some full scale shots before sending it to the professionals. Having just dropped my real motorcycle off in storage for the winter, it was nice to see a bike back in the driveway again. 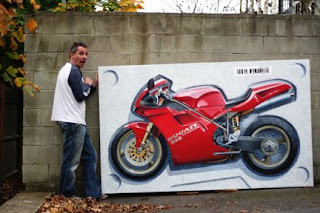 and 300 hours later...the Ducati painting is finished. Well sort of. Right before shipping it off to the studio for pictures I realized I couldn't live with the gas tank. It looked way too flat. I fixed it (no picture...sigh). At least now I can sleep at night. I will post the final picture when we receive it from the studio. So...why Styrofoam for a background? You very rarely see a bike perfectly from the side. I wanted to take it out of being in a situation where you would normally see it—on a racetrack, street or in a garage with a naked girl over it. I wanted to get rid of all that. 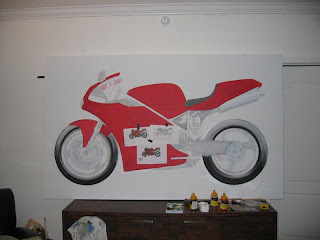 The nice thing is the bike is small enough to be able to paint full size and I thought it would be fun to paint this way as you can see every detail. It’s not like a car. A car is basically –well, every nut and bolt is covered with metal, plastic or glass. Every single one. You don’t really see the engineering at first glance. 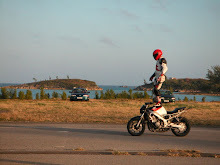 With a motorcycle you do. That’s where the jewelry idea came from. I wanted to display it, not as a toy, but as a precious item. A piece of jewelry. So I went and looked at all the different ways people package delicate items—everythign from computers to collectible toys. There are a lot of different ways to package things—styrafoam is an obvious one and people are familiar with that. It’s cold and machine made and it works nicely with the smooth, very engineered motorcycle. I think for the Ducati it represents the bike. 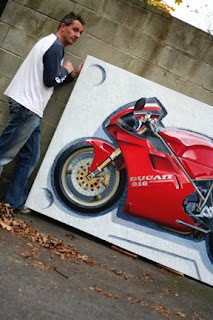 After a few years spent painting mostly portraits and commissions, I decided to combine my love of motorcycles into my artwork. I like the mechanics of the bikes—the physical engineering—the bolts, the set-up, everything. Because I have built so many bikes I know how they go together and it’s exciting to paint them. All different types of nuts and bolts have different finishes on them and that’s part of the fun. It’s all very subtle. Figuring out how to paint it is the challenge. It’s something I enjoy looking at so it makes it enjoyable to paint.